This DCF model template provides you with a foundation to build your own discounted cash flow model with different assumptions. The first step in the DCF model process is to build a forecast of the three financial statements, based on assumptions about how the business will perform in the future. On average, this forecast typically goes out about 5 years. The forecast has to build up to unlevered free cash flowUnlevered Free Cash FlowUnlevered Free Cash Flow is a theoretical cash flow figure for a business, assuming the company is completely debt free with no interest expense. It's used in financial modeling to calculate a company's enterprise value. The formula = EBIT - Taxes + Depreciation & Amortization - Capex – Change in Working Capital (free cash flow to the firm or FCFF). 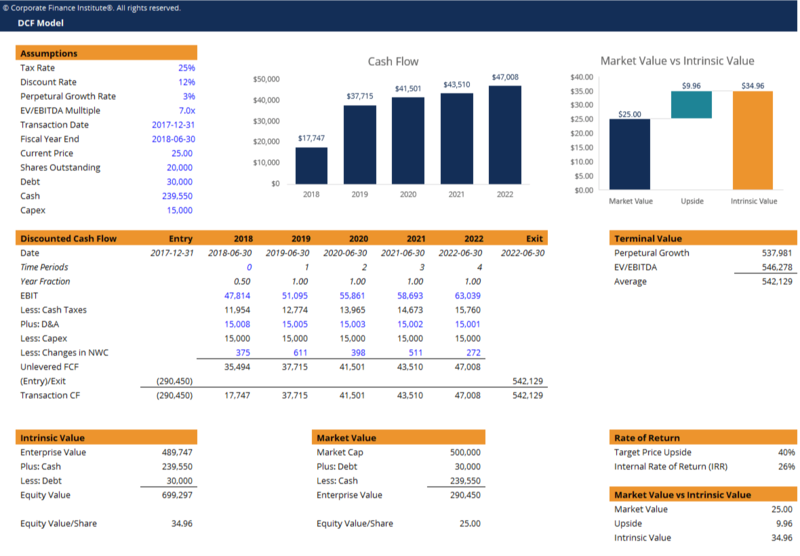 We continue walking through the DCF model steps with calculating the terminal valueKnowledgeCFI self-study guides are a great way to improve technical knowledge of finance, accounting, financial modeling, valuation, trading, economics, and other areas. These resources give you the technical skills you need to advance your career in investment banking, equity research, corporate development, and other areas of. There are two approaches to calculating a terminal value: perpetual growth ratePerpetuityA perpetuity is a cash flow payment which continues indefinitely. An example of a perpetuity is the UK’s government bond called a Consol. Although the total value of a perpetuity is infinite, it has a limited present value using a discount rate. Learn the formula and follow examples in this guide and exit multiple. In step 3 of this DCF walk through it’s time to discount the forecast period (from step 1) and the terminal value (from step 2) back to the present value using a discount rate. The discount rate is almost always equal to the company’s weighted average cost of capital (WACC)WACCWACC is a firm’s Weighted Average Cost of Capital and represents its blended cost of capital including equity and debt. The WACC formula is = (E/V x Re) + ((D/V x Rd) x (1-T)). This guide will provide an overview of what it is, why its used, how to calculate it, and also provides a downloadable WACC calculator. The best way to calculate the present value in Excel is with the XNPV function, which can account for unevenly spaced out cash flows (which are very common).